Last night was a rather sleepless night. As Larry W2LJ mentioned, the rain wasn’t so bad, but the wind was downright scary. Up until about midnight I periodically went outside and walked around the house looking for damage, keeping my back and weight to the wind in order to not get pelted in the face or get blown over. The wind sounded like a freight train coming over the ridge. I was so glad I put temporary guy lines on the tower. Other than some siding on corners popping out, there was no permanent damage occurring, however I noticed my HF tribander and 6 meter beam misaligned on the tower. Under the force of the wind the tribander was beginning to turn and go off azimuth. I rotated the antennas in an attempt to use the wind to true up the tribander. About 3 AM I awoke to metal banging against the house. I got dressed, went outside and found a 10 foot piece of aluminum flashing or trim dangling from the roof eave which shortly fell to the ground. Other than that, no more damage. Amazingly we still had electricity. This morning when I awoke it was still quite windy and blowing the rain sideways, though not as violent as last night. There was no further damage to the house, but the antennas were more misaligned than before. So we were lucky here in Pennsylvania, and are thankful for having power and a home. A lot of people in New York, New Jersey, and to the south and west of us in PA did not fare so well. Glad you and your family are OK and not a lot of damage. Glad to hear things are OK at your QTH. It’s amazing you had all that wind and your power is still on. 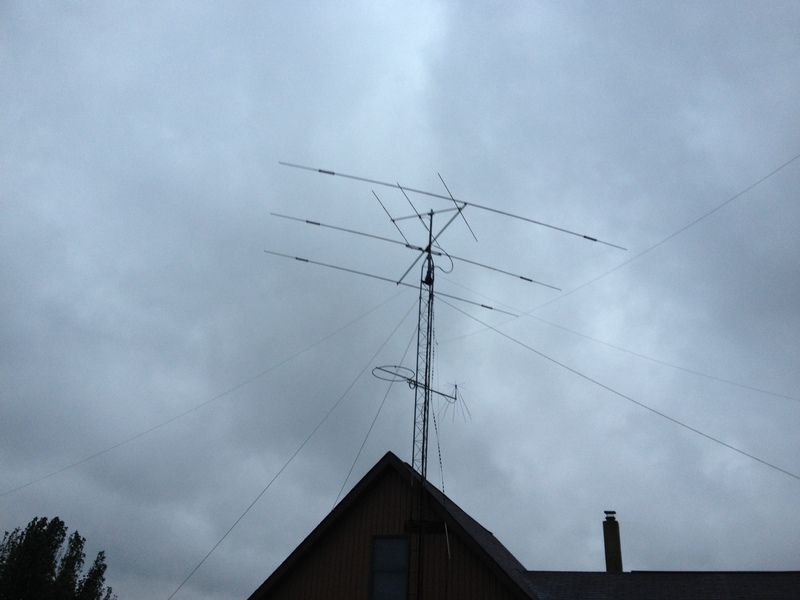 Nice to know your antennas are still in working condition even though you may have to do some realignments.